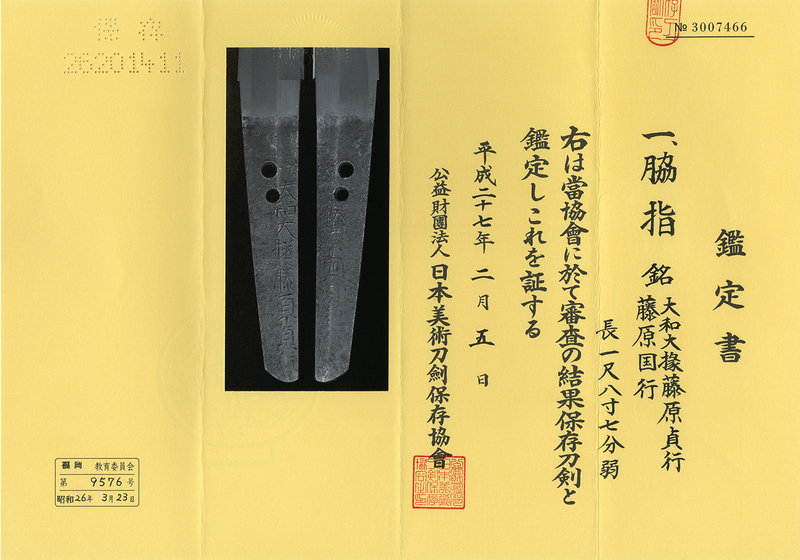 AS13493-脇差：大和大掾藤原貞行(合作刀) 藤原國行-Wakizashi: (Gassaku-to) Yamato Daijyo Fujiwara Sadayuki. Hujiwara Kuniyuki. Signature : (Gassaku-to) Yamato Daijyo Fujiwara Sadayuki. Shinto: Chu saku ranking:Bungo province. This Gassaku sword belongs to Jyo saku ranking. Blade length : 56.6 cm or 22.3inches. Sori : 1.0 cm or 0.394inches. Width at the hamachi : 2.92cm or 1.15inches. Width at the Kissaki : 2.10 cm or 0.83 inches. Kasane : 0.63 cm or 0.25 inches. Era : Edo perios Kanbun era. Shape : The blade is regular size with small sori Kanbun shape. Jitetsu :Itame hada well grained with masame hada mixed with jinie attach. On the Kissaki area, Shinogi ji, a kizu appear and also in Kisaki small tiny rust. Hamon : Niedeki suguha hamon with rather deeo nioikuchi and round shape boshi. and Fujiwara Kuniyuki both Bungo province. Tsuba :Round shape copper plate, some design engrave and hukurin(cover) by syakudo plate. Saya : black isimeji saya. Menuki : syakudo unknown designe.